The test is made by running the machine as a motor at rated voltage and frequency without connected load. To ensure that the correct value of friction loss is obtained, the machine should be operated until the input has stabilized. The current in each line is read. 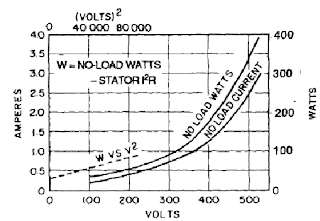 The average of the line currents is the no-load current. loss (at the temperature of this test) from the input gives the sum of the friction (including brush friction loss on wound-rotor motors), windage, and core losses. Separation of the core loss from the friction and windage loss may be made by reading voltage, current, and power input at rated frequency and at voltages ranging from 125% of rated voltage down to the point where further voltage reduction increases the current. 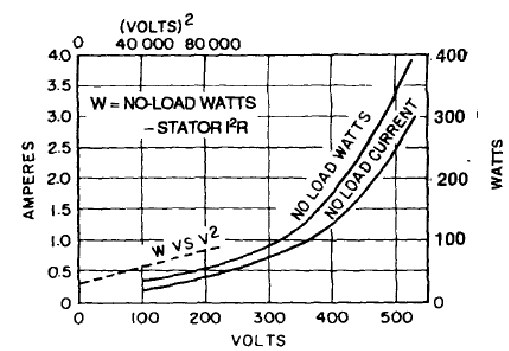 Power input minus the stator I2R loss is plotted vs. voltage, and the curve so obtained is extended to zero voltage. The intercept with the zero voltage axis is the friction and windage loss. The intercept may be determined more accurately if the input minus stator I2R loss is plotted against the voltage squared for values in the lower voltage range. An example is the dashed curve shown in figure 1. The core loss at no load and rated voltage is obtained by subtracting the value of friction and windage loss (obtained from 5.3.4) from the sum of the friction, windage loss, and core loss (obtained from 5.3.2).